Fur trade warehouse at Fort Langley, the same as found in any fur trade fort. 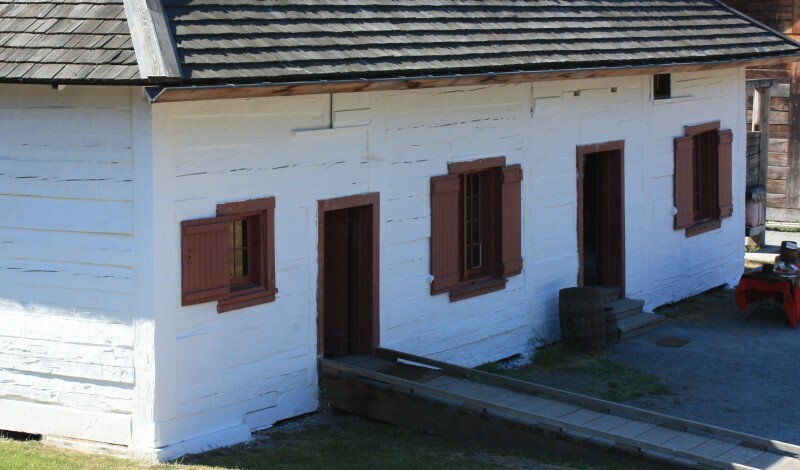 This is probably very similar to the warehouse or storehouse at Fort Nisqually, that was emptied of its goods so that the Fort Nisqually men, and those of Fort Colvile, could have their dance. There is another brigade trail which I keep forgetting to mention: of course, until recently I did not know a lot about it. In fact I was quite surprised, only a few years ago, to discover that the celebrations that went on at modern-day Fort Nisqually are based on the arrival, at that post, of the 1855 brigades from Walla Walla and Fort Colvile. Since 1852, the Fort Colvile brigades returned to their Columbia River route and were no longer taking out their furs to Fort Langley. But they were doing things differently: Their pack-horses would leave the post in early summer and pick up their goods at The Dalles, upriver from their headquarters of Fort Vancouver, on the lower Columbia. In this way, all the now-useless Indian trade-goods at Fort Vancouver were cleared out of the warehouses and sold at Fort Colvile, where there was still a market for them. Perhaps the Fort Vancouver warehouses were emptied, as in June 1855, Dugald Mactavish advised the London Committee that “The returns of Colvile & Walla Walla will this season be taken out to Nisqually, with horses, and it is my intention to go over there in a few days for the purpose of meeting Mr. [Angus] McDonald, who I am in hopes will reach Puget’s Sound with his brigade by the 1st May [July was meant].” [B.223/b/41, HBCA] As at Fort Vancouver, there was a surplus of Indian trade goods at Fort Nisqually, which were not useful to the Americans who now lived nearby. On the 2nd of July about midday, I was startled to see a tall, rather slim man ride into the Fort, dismount and walk toward the large house where he was met and kindly received by Doctor [William Fraser] Tolmie. This was Angus MacDonald [McDonald] of Fort Colvile, and now in charge of the Brigade of upwards of 200 horses, most of them packed with furs..
Well, all was ready and at an agreed-upon signal from MacDonald a fair start was made. The young Englishman jumping ahead at the start and, to our astonishment, he increased his lead until the end of the first 50 yards when Pichette, the Iroquois, shortened the distance between them to about three yards. From then on to the winning sprint the handsome young Iroquois shortened the distance, but to the intense disgust of MacDonald and his company, the Englishman won the race by a distance of about four or five feet. I did find an Edouard Pichette here: son of Louis Pichette (Dupre) and a woman he met in the Snake district. This Edouard was born in 1830 or thereabouts, but unless his mother had an Iroquois father (which is quite possible) this is not the Edouard Pichette of Fort Colvile. But it doesn’t really matter: Huggins might have completely misidentified the man, as his story was written years later from memory. Its still a good story, though. The Fort Colvile horses put on weight and their wounds healed. The Walla Walla brigades left the post on July 18th with 55 packs of goods, but the Fort Colvile goods were still being packed. On Wednesday, July 25th, “Mr. McDonald with the Fort Colvile Brigade started with 151 pieces goods.” [Fort Nisqually Journals]. But before they left, Dr. Tolmie organized a party. The Indian women and the Halfbreed women and girls were passionately fond of dancing and almost all the Indian women had an original way of dancing, a step of their own. It was very comical to see them, ten or a dozen at one time. “Jigs” were their favorite dances and they would stand facing their partners and keep time to music by simply bobbing or jumping up and down. No step, no change, but always the same jumping with both feet from the ground at the same time. The Fort Colvile men made it home, in safety, to their fort, but they arrived there just before the Yakima Indian Wars broke out. This was the only time they came out to Fort Nisqually: in future years they would return to the brigade trail over the Tulameen Plateau to Fort Langley. But Fort Nisqually still celebrates this brigade, and if you live in the area, you might want to visit to learn more about our shared history. 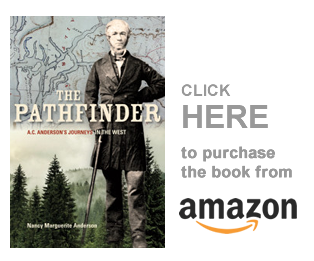 Another fascinating tale on the story of the Pacific North West! Thank you, Nancy! You’ve just given me another thought about how I may have acquired some of my DNA matches!